With the introduction of trenchless technologies, traditional methods of sewer repair are outdated and unnecessary. At Nu Flow Oklahoma, we promise a better repair experience for Lake Aluma residents and commercial property owners. Our professional technicians conduct the repairs with speed and efficiency, quickly repairing problematic pipes and restoring sewage flow without digging trenches. We first begin the repair process with a camera inspection, recording the visuals of the inner walls of the pipe and providing our customers with an error-free diagnosis. Once we have clearly determined the problem within the pipe, we clean it through a process called hydro jetting. A powerful stream of water is blasted through the pipe, thoroughly removing any contaminants that may interfere with our repair process. Once this is finished, we insert a liner filled with epoxy resin through a small access point into the pipe. An artificial bladder inside the liner inflates it and forces the resin to stick to the inner walls of the pipe. The bladder is deflated and the resin is cured. The epoxy resin forms a complete seal in the pipe, eliminating holes and cracks and creates a single, new pipeline without joints. The pipe is strong and durable as a result, resisting tree root intrusions and corrosion as well as ensuring that it won’t break or crack like clay, cast iron, or PVC pipes do. This new pipe’s material is very smooth, improving the flow of sewage and wastewater through the pipe and making clogs less likely to form and create problems. 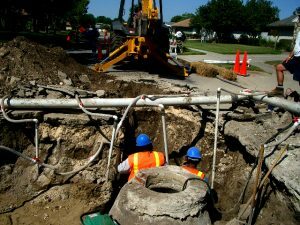 pipe This process takes a few hours to complete, and within a day, your sewer lines are fully repaired and restored. This new pipe is long-lasting and guaranteed to function efficiently for at least 50 years, leaving our customers with peace of mind and security knowing that this product will last for many years. Nu Flow Oklahoma is one of the best companies to bring trenchless technology to the city of Lake Aluma. With us, your sewer lines will be repaired in no time. We service all residential, commercial, and industrial properties. For more information, feel free to call or send us an email.